Criterion products are protected by a warranty which covers defects and manufacturing issues. Your product should give you many years of use and enjoyment, but in order to do so and prolong the life of your product, specifically the down which is organic, we recommended you follow our down care guide. Store your down sleeping bag in a clean and dry area. Store your Criterion sleeping bag in the mesh storage sack provided or hang in a wardrobe via your bags hanging loops. Do not store your sleeping bag in a stuff sack or compression sack. Always dry out your bag at home after every trip before storing it away, never put a damp bag into storage. Remove your sleeping bag carefully from its stuff sack up to 1 hour before use. A gentle shake will help ensure the down is fully lofted to its potential and will help to maximize warmth retention. A good quality sleeping mat is essential and will provide comfort and insulation. Always use a sleeping bag liner made from fabric such as cotton/poly-cotton, silk or fleece. It will protect the down and inner fabric from perspiration and body oils, both of which can inhibit down loft and warmth. A liner will also act as an insulation layer potentially making the bag a little warmer. Criterion down sleeping bags can either be cleaned at home or by a professional cleaning company. Mix a down cleaning product such as Nikwax down cleaner or pure soap flakes with up to half a bath of warm water. Immerse the whole sleeping bag in the water and gently agitate to ensure the entire sleeping bag is thoroughly wet. Gently agitate every 5 minutes for up to half an hour. Drain water from bath and refill. Repeat processes 2 & 3 until all down cleaner has been removed, then allow to drain. Gently roll the bag (still in the bath) to remove excess water. Dry in a tumble dryer on low heat until down is completely dry. This may take several hours. Always handle wet down products with care. Excess dryer heat can damage down and shell fabrics. Always ensure down is completely dry before storing. Criterion sleeping bags consist of a set of baffles/chambers which contain down. The side edges of some of the baffle chambers are not fully stitched but are stitched at the top and bottom. This allows very small amounts of lofted down to move between chambers. As down is a natural product, with each cluster being individual, this construction method helps the down in the chambers to equalise allowing optimum fill within each chamber. When down is wet it clumps together into balls which could pass through these gaps if the sleeping bag is not handled with great care when wet. 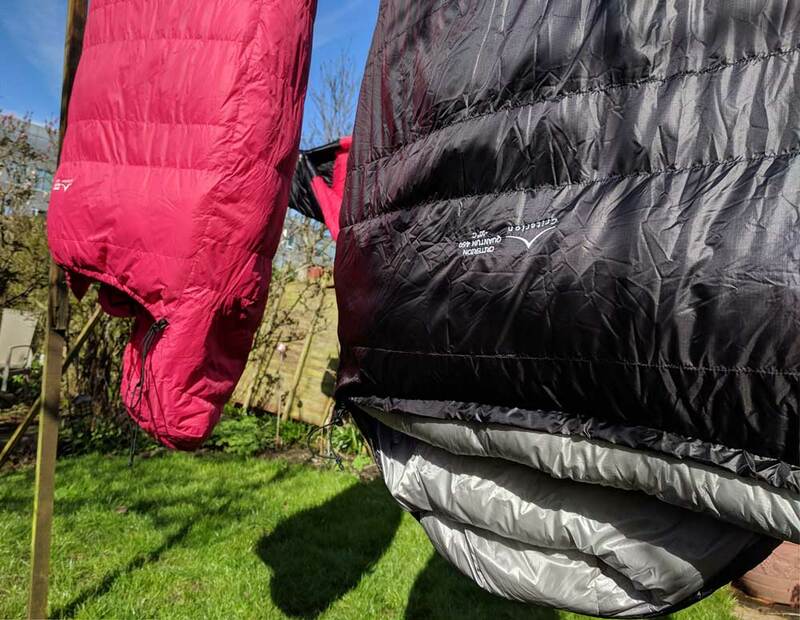 Sleeping Bags can be aired on a washing line on a warm dry day.